Futon mattresses help solve the space problems you might have when friends come over or when you have a large family. The challenge, however, comes when you decide to choose a futon mattress. So, what do you need to consider? Well, this article provides a list of the most important considerations when choosing the best futon mattress. Purchasing the wrong futon mattress can lead you to unexpected problems. After a long day at work, it is good to rest on a mattress that almost massages your body. This kind of mattress ensures that you have a refreshing night, which leads to a bright morning. 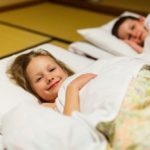 The following are some of the most important considerations you need to make when deciding on the futon mattress that fits your needs. A futon mattress should save you a lot of space. That is its prime purpose. It might not work so well when you purchase a futon mattress that takes up most of unnecessary space. You should also consider how often you would unfold your futon mattress to use as a bed. Most people purchase futon mattresses to use for sleeping, which means regular unfolding. If you are in this category, you should consider the rest of the furniture and the available space for the futon mattress. With the right planning, you will save a lot of space. A futon mattress should be very comfortable. Once you decide to purchase a futon mattress, you should consider the thickness. A six-inch mattress should be enough to give you perfect sleep with no aches experienced the following morning. However, you might require a thicker mattress depending on the frame. When you have a wooden frame, which is usually hard, you might need to purchase a thicker mattress to keep your back safe from the hard frame. It is advisable to purchase each part of the futon mattress separately. The best futon mattress should match all your preferences. When you put it together yourself, you have higher chances of meeting all your specifications including the measurements you take for the space available. 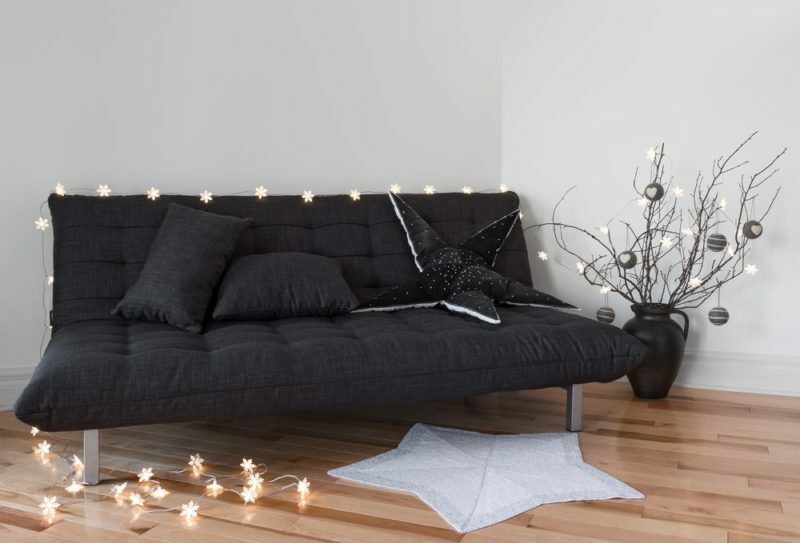 A futon mattress should be stylish. Even though it should save you space and transform to cater for your sitting and sleeping requirements, it should remain pleasant to look at. There are different things that you should look at to decide whether the futon mattress matches the look you desire for your home. Some futon mattresses have frames designed to sit directly on the floor, while others have legs that make them look and sit like regular sofas. Different designs also allow for different folding styles. There are bi-fold and trifold futons. The bi-folds, which fold once, fold to look like a regular sofa. This means that they have arms and legs like those of a sofa and are easy to deal with. The tri-folds, which are more complicated to deal with, fold twice, to three parts. The frame is the most important part of the futon. Some futon frames are made of metal and some wood. Even though metal lasts longest, it might be, the wrong choice especially if the rest of the furniture in the room is made of wood. Wood, which is the most popular material used for making futon frames, might not last as long as metallic frames. However, wood allows for the best designs at a cheaper price. When deciding on the kind of wood to use for your frame, make sure you choose wood that comes from strong and durable trees such as oak and cherry. Your futon is a sofa, and a mattress. 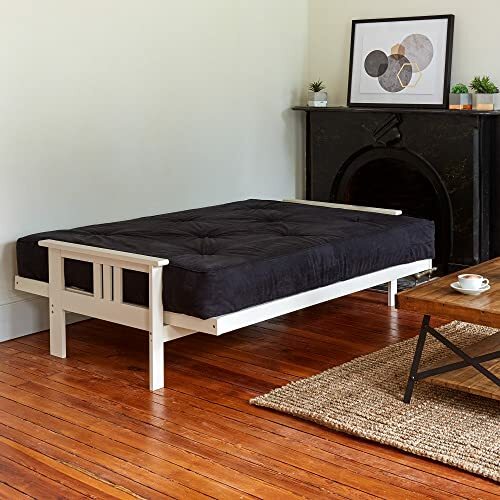 After purchasing a futon, you have the job of making sure that all the accessories such as pillows and sheets are available for anyone who needs to transform it into a bed. The kind of accessories you purchase, however, should be as comfortable, stylish, and easy to clean as the rest of the furniture in your house. Two pillows, that act as sofa and bed pillows should be enough for the futon. Two sheets of different colors should also be enough. Different mattresses exist made with different material. Each of these materials has different pros and cons. The most preferred mattress material is foam. 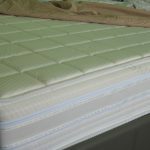 Foam provides the most comfortable and soothing sleep. However, there are additional materials that provide the same level of quality for different prices. Wool filled mattresses are rare. They, however, are better since they provide a lot of warmth. In addition to the warmth, the wool is completely soft making it very comfortable to sleep on. In places with low temperatures, this is the best material. Cotton filled mattresses are also advisable. 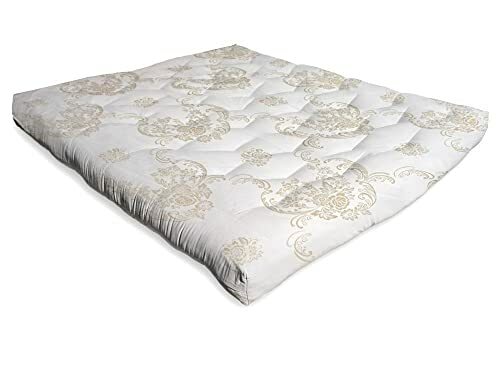 Even though cotton mattresses cost less than foam and wool, they are warm, comfortable, and not to forget, very light, making the mattress completely easy to fold without messing up the mattress. The metal spring mattresses are also common. The spring mattresses are very comfortable because they provide a shape depending on how you sleep. They however, have a history of quick damage especially when exposed to high pressure. When you purchase a spring futon, you should be ready to spend more after some time to replace and repair. This is one of the most popular futon mattress in the market. 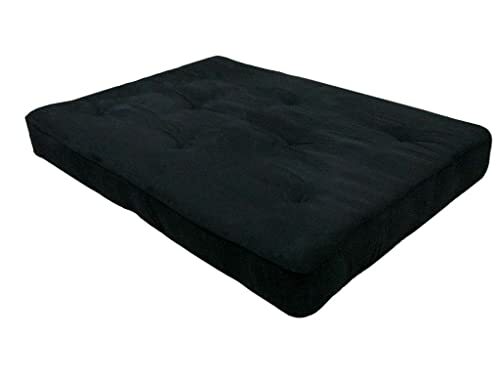 With a beautiful black color and a comfortable 8-inch mattress, you can be sure to get the most soothing sleep on this futon. Each individual coil in the futon has an encasing covered with a micro-fiber cover. Between the cover, there is layering made of polyester and foam material to ensure that you get the best of comfort without feeling the coils on your back. The futon has 522 individual coils to ensure ample support. The support provided by the 522 coils in the futon ensures that you can have a comfortable experience when using the futon as a couch and as a bed, no matter what you weigh. The manufacturer of this specific futon provides two options. There is a 6-inch futon and an 8-inch mattress you can choose depending on your preference. This mattress can fit in a range of frames. The default cover that comes with the futon is non-removable and is therefore not washable. In order to ensure that the futon remains fresh, you would require an additional one that you can replace. After some time of folding and unfolding, a space appears between the coils, which reduce the comfort while sleeping on the futon. When new, the futon has a certain unpleasant odor. However, the odor disappears after some time of usage. This futon manufactured by classic brands provides the most comfortable sleep and sitting experiences thanks to the mattress. This mattress, eight inches thick, has coils integrated in it to support the foam used to create it. The coils, wrapped individually, have a cover made of microfiber. This ensures that your mattress remains comfortable and durable. The stitching used in the manufacture of mattress is strong, which increases the durability. The design of the mattress, not only hides the advanced engineering used to make the mattress comfortable, but also provides style. The 8-inch thickness provides the most comfortable sleep with little chances of feeling the futon frame. Due to the eight inches of material used in the mattress, it is hard to fold, especially when you decide to travel with it. This futon has a long life expectancy. The organic wool used in the manufacture of the mattress ensures that the mattress remains comfortable and last longer than original mattresses. The mattress comes in default white color, which provides perfect style in your house. Despite the light material, the mattress is strong enough to hold up light and heavy people. The material used in the mattress is unique. It provides the most comfortable sleep. It is very easy to fold, despite its thickness. Even though it is easy to fold, it remains firm even after years of use. The material not only provides comfort, but also warmth. This makes it a perfect futon for people who prefer to purchase futons for their children. The white default color is very hard to clean. 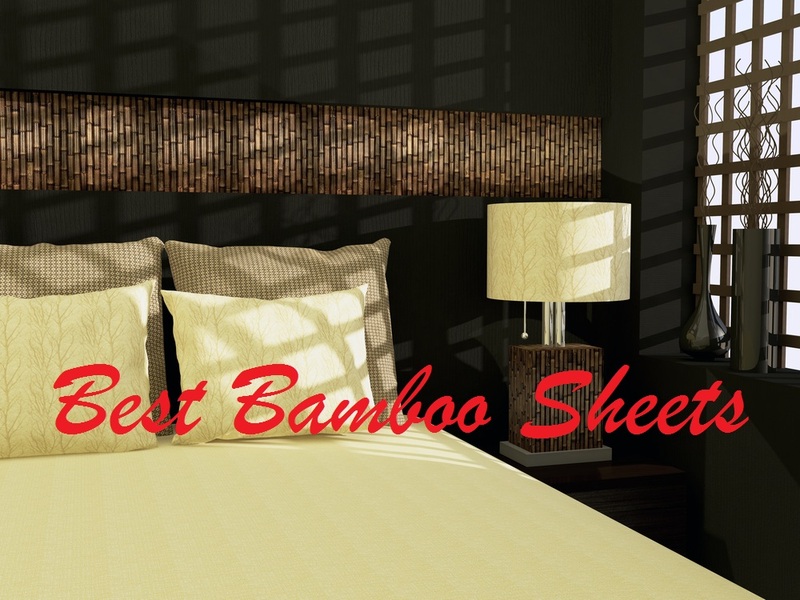 You must ensure to use an additional sheet on the mattress while using it to make sure it remains clean and fresh. 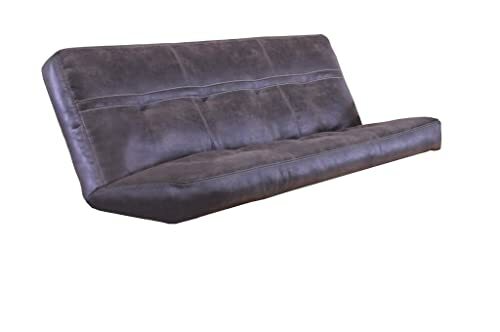 Unless you decide to purchase a frame with arms, this manufacturer did not include any arm design while designing this futon. This specific futon has an 8-inch mattress with a default micro-fiber cover stitched on it by the manufacturer. The futon also has foam and polyester layers between the cover and the coils. The size of the futon ensures that it fits in any futon frame you might have. The micro-fiber cover is available on the top and the bottom of the futon, which ensures durability. 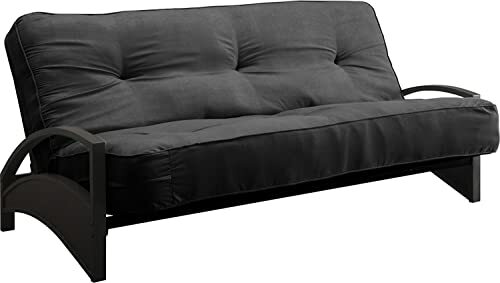 At a highly affordable price, this futon provides a very comfortable experience when used both as a couch and as a bed. The mattress is very firm, yet soft and comfortable. 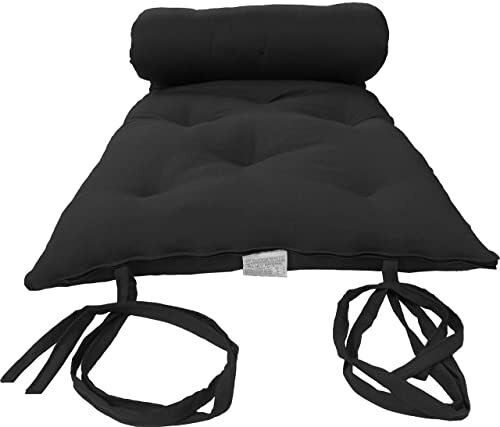 The coils also engulf your body perfectly while you sleep or sit on it. The mattress, even though is thick, might not be as durable for heavy people. There are chances you might feel the coils when you sleep on it. The product has a certain odor. This odor however disappears after some time. You can use air-fresheners to reduce the odor. The futon does not have straps to hold it to the frame. For this reason, there are chances of the mattress slipping off when used as a couch. The design used in the manufacture of this mattress is unique. The unique design does not require a frame in order to use the mattress. The mattress, which has its own frame, folds and sits steadily as a couch. The mattress’ material is from Palance fabrics. This material complements the mattress’ thickness making it more comfortable to sleep and sit on. It comes in three different colors to give you options from which you can choose to match your preferences. The unique design removes the necessity to purchase a frame. The mattress is hard to damage. Even for people with pets, this futon can handle rough treatment by animals. This futon is a bit heavy. Unlike other mattresses, it might be difficult to use for mobile people. This is one of a kind futon mattress. The design allows for one of a kind furniture addition to any room. The futon, which sits perfectly in any space, comes in different color to suit your specific house theme. The futon does not sit on the floor, which helps it match any other couch in your home. In addition to this, when folded, the futon perfectly matches any other comfortable bed. This mattress is completely beautiful. The manufacturer provides six different colors that increase your options, especially for people that prefer futons that match with other furniture in the house. The mattress is twelve inches thick. Apart from being unique in terms of thickness, it is very comfortable to sit and sleep on. Even as a couch, it remains completely large to sleep on without unfolding. The material used in the mattress is foam. This foam has cotton fiber wrappings to improve comfort while increasing the warmth. The only con related to this specific futon is the absence of arms. Arms are a very large part of any couch to improve the sitting positions. Being a futon designed to work best as a couch, arms are important. The manufacturer of this futon made it possible to roll up perfectly for storage. With a comfortable polyester fiber and a foam layer added to the cotton material, you can be sure to have the best sleep on your futon without worrying about any back pains. Even though some special care is necessary on your part to ensure durability, it is extremely comfortable for people of different weights. It is very comfortable thanks to the layer of foam added to the polyester fiber and light cotton material. In case it shrinks, you can place it in the sun, which will help it expand again, ready for storage. Unlike most futons, this specific type is easy to store once you roll it. This makes it very easy to carry around for different functions. This futon requires special care to ensure it lasts longer. In most cases, the futon initially contracts after purchase. 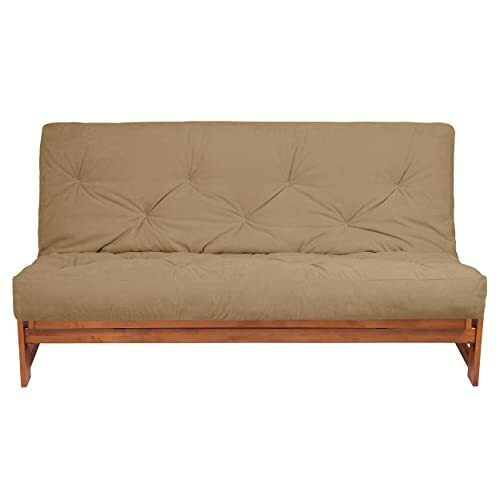 The futon is not easy to clean unless you have an additional removable cover to use. Compared to other types of furniture, this is obviously the most necessary. For people who need to go camping or invite many guests to their home, this a necessity. It ensures you have a good sleeping experience and once you wake up, transform it into one of the couches in your home. Different futons provide different designs. They also fit in different spaces. However, the list above makes it difficult to choose between different attributes of the futons. However, when you decide to purchase a futon for a specific purpose, ensure to analyze the different attributes you require and purchase a futon that fits and appears perfect in your home.